make it perfect: .Designs in mags. Yesterday I received a copy of Handmade magazine in my letterbox...after months of waiting, two of my designs have been published! 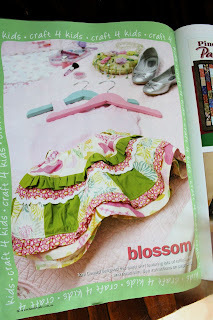 This issue of Handmade has a "Craft 4 Kids" special segment and both of my patterns were a part of this segment. 2. 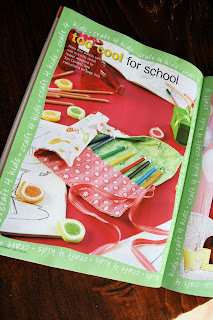 Too Cool for School Pencil Roll - quick and simple to whip up, perfect for easy Christmas presents or getting ready to go back to school! Wow! Congrats Toni!! That is so cool. Might have to buy a copy. I just got a call from Mari telling me she has her copy and saw you! HOW EXCITING! Pip is going to borrow my hat pattern to make herself a hat, and is also going to make me one! YAY! Wow...I think you're gonna be famous! You're so clever! I love this little skirt. I have finally made the wrap skirt pattern I bought about this time last year. Very happy with it, will have to post a picture on my blog. You are so clever! Congratulations. How cool is that! You are such a clever lady. I love reading the Handmade magazine, although I have not been buying it as often due to the finances, the library has copies to borrow which is a bonus! I will definately buy this issue. Sooo have to frame those pages and pop it onto your wall :-) That is so exciting, what a great boost for the ego huh? I'm doing some stashbusting today and will make a pencilroll..
Just saying that we brought Handmade today and I am excited to make one of the pencil cases for Amelia. I also must say that it was a really good issue this time as it had so many cute projects to make. I love the owl!